Eight individuals sitting down to dinner. Two no beef and no pork. What to eat? What to eat? I need a foolproof meal in a snap that will surely satisfy everyone's needs. The answer every time ~ Family Taco Night! With this recipe, I'm able to prepare a little something for everyone and the folks can pick-and-choose to their liking. 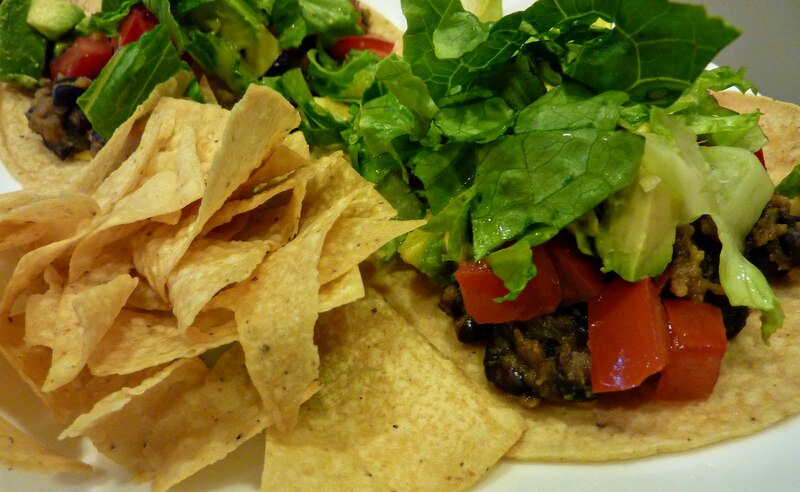 Our vegetarian fills her tacos with black beans and sweet potatoes. Our cholesterol conscious folks fill theirs with the ground turkey. Our little corn allergy buddy takes his in a bowl with all the fixin's. So easy. So fast. So satisfying. Start the rice to cook. With the rice going, brown the ground meat in a saucepan over medium-high heat. Once no longer pink, approx. 8 minutes, add 1/2 cup water and 4 TBS taco seasoning. Mix well to combine as some of the water boils off. Turn heat to low to keep warm. While the meat is browning, in a separate saucepan combine 2 cans of black beans and 1 can of sweet potatoes with their syrup. Cook over medium heat until heated through. Mash the sweet potatoes with a fork. Mash a few beans while you're at it. Dice ripe avocados, tomatos, and lettuce for the topping. Shred the cheese if you have cheese eaters in the group. Once the rice is finished cooking, you're ready to go. Set everything out in an assembly line and let the folks have at it. Don't forget to squeeze the lime over the top of your taco. Yum! This song grows on me every time I hear it. I love the line about the "ice cold beer sitting in the console". First thing, I haven't heard the term "console" in a while. Second thing, I haven't had an ice cold beer in an even longer while. The lack of real beer is the thing I miss most about being gluten free. I'm reminded of how much I love beer when I hear this song. It's the only time in my gf existence that I chant "damn gluten free."